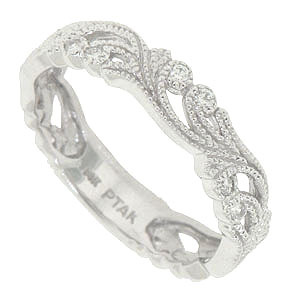 Lacy ferns cover three quarters of this 14K white gold antique style floral wedding band. The curling tip of each fern is set with a round diamond. The wedding ring is frosted with a delicate milgrain design. 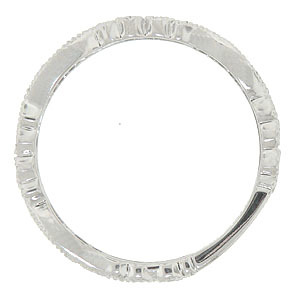 The ring measures 4.50 mm in width. Size 6 3/4. We can re-size or order in any size. Also available in 18K, yellow gold and platinum.